This bridge bidding convention is used by the defending partnership. More precisely, it is used by the third player (the opener’s partner) in the first round of the game. It is a handy little technique to help help the third player decide which card to play. Most commonly, the Rule of 11 is used when a game is played in No Trumps. You use the rule if you believe that your partner led the 4th highest card from their longest suit. You can’t be certain that they did, of course, but you are guessing that they have. As soon as your partner has made the opening lead the person who is dummy lays their cards on the table and takes no further part in the game. You can now see 50% of the cards (your own and dummy’s). Because you believe that your partner holds 3 cards higher than the one that they led you can now apply the Rule of 11 to the fourth player’s hand to help you work out if they hold any cards higher than your partner led. If they don’t and dummy has played low, you don’t want to waste a higher card if your partner’s card will win the trick. Imagine that your partner opened with 7 of a suit. Dummy’s cards have been laid on the table and the 3 has been played. You can see that Dummy also holds K and 10. Your hand contains A, J and 2. Is it necessary to play the Ace or the Jack to win the trick, or can you play the 2? 11 – 7 = 4 . The Rule of 11 tells us that there are four cards higher than 7 that our partner doesn’t hold. (Remember, we are assuming that partner played the fourth highest of their longest suit, so are assuming that they also hold 3 higher cards,) there are 4 higher cards that are NOT held by partner. Do we know where those other cards are? We have the A and J and we can see that dummy has K and 9. 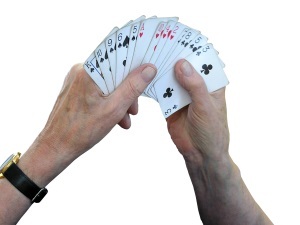 We can see all of the four higher cards and so believe that the fourth player can’t win the trick by playing a higher card than the 7. If you decide to use the Rule of 11, just remember that it is based on an assumption. That assumption might be wrong. Your partner might not have led the fourth highest card from their longest suit. Ye, it’s good – but not perfect! In my experience bridge and golf are the two most difficult leisure activities (I don’t know if bridge is a sport!) about which to learn something by reading. Look at Susan’s opening line (sorry about the pun!) “Imagine your partner opened with 7 of a suit”. Would that not be better put by “imagine your partner played an opening lead of a 7 of a suit”. Would the next sentence be better put by “the oposition then played the 3 of that suit from dummy”. Lastly, Susan is emphasising that partner does not hold 4 higher cards.By my calculations I feel that there are only THREE higher cards i.e. Q, 10 and 8! So where does this leave Susan’s explanation?